Why I Wake up Every Day: ARE THESE REAL FAIRIES? One of the reasons I wake up every day is magic. When I say magic I include here fairies, elves, pixies, goblins, and mostly all the mythical creatures we find so often in Germanic, Irish and Norse mythology. I cannot explain why and how it got to me but yes I am a 33 year old lady who often indulges herself in idle woolgathering about fantasy creatures and mythical realms from far behind the skies. 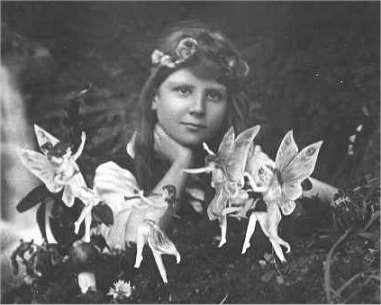 To my fully astonishment I have recently discovered that Arthur Conan Doyle believed in fairies. Not only he believed in their existence but he actually wrote a book about them called “The coming of the fairies” (1921). 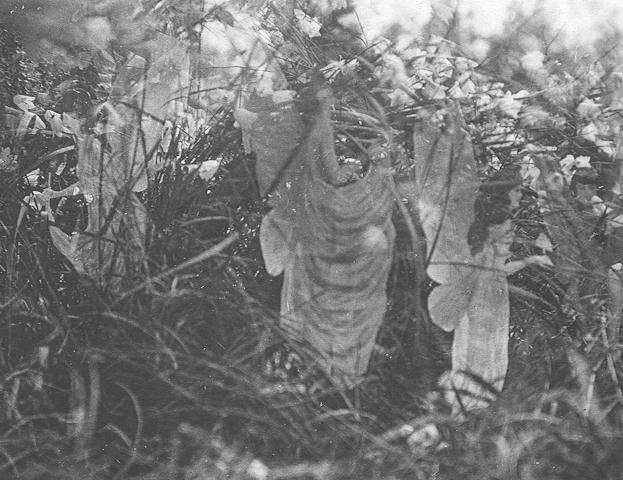 And that is how I found out that there are actual photographs of fairies from the beginning of the 20th century, taken with a Kodak camera of that time by two teenage girls in a little town in England called Cottingley. Elsie Wright and Frances Griffiths claim to have experienced for several times impressing encounters with small shiny creatures whom they immediately befriended and engaged together in beautiful child games. Since the photographs caused quite a stir at the time they were subjected to complete and professional examinations by the Kodak technicians who apparently couldn’t find anything wrong with them declaring the pictures “genuine”. Well I am not a lunatic, I am very interested in theosophy, but these pictures are a bit disappointing. I mean the fairies seem quite fetchy considering they lived beside a stream in the back of a garden; they have chic hairstyles and long fancy garments with flashy accessories. My opinion is that, if they really exist, they should look a lot better than some second hand hookers. Yes.I do beileve thes photos are real just a few nights back at the begenig of summer my mom told when she was getting rady for bed at maybe 9 or 10:00pm.She said she happen to look up at the wendow and see something remarkable the street lights casts a shadow of the tree leves what she saw was Not leves form the the tree but what my mom and i beileve Thay wher Fairies! She Saw Wangs like thay wher Butterflys But did not have the Body of a butterfly,The figgers my mom sew was more humen like the anything!~ She said it was FFor on the left and for on the right wendow. and I saw the EXACT Same Last NIGHT Outside MY WENDOW and calld she in my room to show her and they wher still ther but when my Brother came in they wher Gone. And every othe night My mom and See them..They come And Visit Us Every Other Night~..But only my Mother and i~. wow Yakumo incredible. That must have been a lovely experience. On a trip to Ireland last year, I was certain I saw something. Not the fairies such as these in the photos, but something short, dark, and almost troll-like. We were driving down a dirt road and just as we came to a small bridge over a little stream, I saw it. I was dead certain what I saw, and when he stopped the car for me to look, I couldn't find anything. At first glance, I was thinking "Is that a German Shephard?" because I saw what I thought were haunches, but the legs were really short and stumpy. Then for some reason I said "I think that was a troll." Ireland was like that everywhere. You can feel it. The spirit world is underground, just barely under the surface, and at times you can feel it all around you in the air. Wow Lori that is absolutely fascinating,fascinating. Txs so much for sharing this, I really appreciate it :). 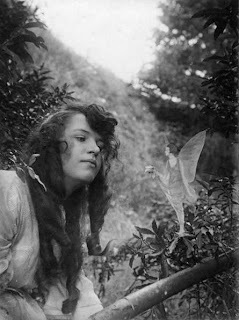 I have never seen a fairy but I believe they are real. I hope to see one, one day. My Friend's sister swears that she saw Fairies on more than one occasion when she was a child, to this day is still convinced,she is now in her 50's I found this forum after watching an episode of Torchwood, all about faires :-) Season 1 Episode 5 - worth a look. I will be traveling to Ireland next year, I hope I too have the same feelings as Lori experienced. Thank you for the feedback, I shall try Torchwood. Kisses. Hello dear Unikorna, I came to visit you and know how you are. This post is very good re-read. That maximum! So I will not even want to get rid of you! The world is magical. There are connections! At first I did not have many comments. 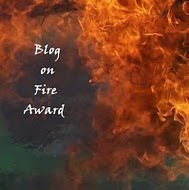 I've been blogging since December 2008. Sometimes I got discouraged. We write because we love doing it, but the visits are really as a thermometer and make us very happy. Keep your comments and answer them! They are like BRIDGES between friends! Whenever I can, I'll come see you. And whenever you need, just call me. I'm far away physically, but not in heart. "Ireland was like that everywhere. You can feel it. The spirit world is underground, just barely under the surface, and at times you can feel it all around you in the air." Lori, you gave me goosebumps! This post makes me want to write feverishly about other worlds, shimmering just out of normal human sight. I think I'll pick up that book by Arthur Doyle. What many people has seen here in a small town called batopilas, are a small human shaped creatures, not flesh creatures, like if they were made of leaves and branches, small and run fast, meaking ver little noise, people has seen them at day light and sometimes late, but not at night. They seem to do nothing bad or good. Whar they could be? A gropu of people has spent some wee trying to get a picture. 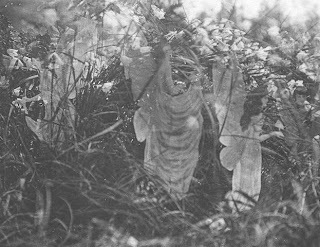 @Grace The lady mentioned at one point that they were fake but then she retracted again..
not sure about those photos - however - fairies are real. Like ghosts, proving to everyone that energy exists in those forms is daunting. All the same, I think what matters is what you feel with your spirit and what you do with that. Best regards. hi, um ive never seen a fairy, but i know they are real... i was only 7 when i was most certain i had seen one. im have been researching them and hope to find one. I saw a different dimension like a fairy tale place when I was around 6 and there were fairies in it and many different creatures. It was beautiful and I never saw it again but I will always know that exists.. I believe. THE FACT OF THE MATTER IS THAT..WHAT YOU HAVE SEEN OR ARE LOOKING FOR IS A SMALL PART OF THE TRUTH. ALL THE SO CALLED "MYTHS", BIBLE STORYS, AND PHOTOS REVEAL THE PIECES OF THIS PUZZLE CALLED LIFE..BUT THE THING IS IF I OR ANYONE TOLD YOU WHERE THESE MYTHICAL CREATURES RESIDE WOULD YOU BE WILLING TO GO? LETS BE REAL, IF THEY LIVED IN A VISIBLY BEAUTIFUL PLACE IT WOULD ALREADY BE INHABITED BY HUMANS.. WHICH MEANS THEY ARE HIDING WHERE YOU'D DARE NOT GO..AND I KNOW OF THESE PLACES AND IF ANOTHER KNEW THEY EXISTED ONE WOULD WONDER WELL WHAT ELSE EXISTS..AND SOMEONE OR SOME GROUP OF PEOPLE DON'T WANT YOU TO THINK LIKE THAT. Have you heard of psychic vampires? A lot of people have, but just to clarify, they are people whose auras cannot sustain themselves, so they feed off of the auras of others. These are the most common, most recognisable of a kind of people called leannan sidhe. According to the mythology of the Irish Gaels, these are people who have remnants of the Fomoire, (or Fomorians, anglicised). Their spirits were literally shattered by the Celtic gods (probably a different group of proto-fairies) and the remnants fused with mortal souls. 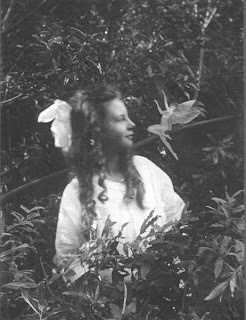 So yes, fairies do exist, and they are in far closer reach than people think. They're all over the place. Not the little garden fairies or trolls or banshees, what have you, (not that they don't exist too) but every day people (yes, like me, in case you were wondering) who have fairy blood in their veins. Further proof. If you believe in auras and energy work and stuff, you'll probably be aware of the exercise in which you completely relax your body, hands apart, and then slowly bring your hands together until you can feel your aura between your hands, causing a very noticeable resistance. The first time a person tries this, their aura is usually about the size of their head or a bit bigger. Well, I'm a psy-vamp, and mine was about the size of a golf ball. But my girlfriend happens to be one of the rarer kinds who have all the little bodily advantages of psy-vamps without the inconvenience of an insufficient aura, and her first time her aura was almost two feet across. I could feel her do it from across the room. Even for me, that was one of the most astounding magical experiences of my life.